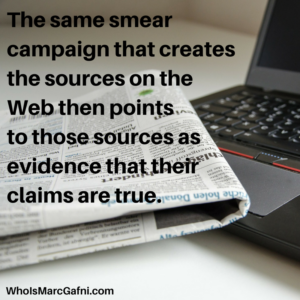 Marc Gafni on Digital Abuse - Dog-Piling of Sources - Who Is Marc Gafni? In this clip, Marc Gafni explains how false sources get created and then cited as evidence for the next source. This is what he calls Dog-Piling of Sources. It is also the Methodology of the Big Lie, which is: A lie plus a lie equals the truth. One of the features of Internet abuse or what we called crowdsourcing a witch hunt is the dog-piling of sources, and that is a terrible affront to integrity and justice. And I’ll just tell you what it means. I experienced it myself. And it happens. It’s a classical feature of McCarthyism, communism’s worst expression, which was Stalinism, Stalinist trials which were false convictions based on trumped up charges. Here’s how it works on the Internet. I’ll give you a personal example from myself. A smear campaign is launched against me 2015, the end of 2015, beginning of 2016. Someone goes on my Wikipedia page and says: Gafni confesses to being involved with 14-year-old girls. Not true, complete distortion of a relationship I had when I was 19, complete distortion. I’ve talked about that in an earlier clip. I’ve written a major article about it. Then an opponent of mine, a political opponent who I’ve never met other than for maybe a minute, who has a virulent kind of agenda which is rooted in malice, a kind of visceral competition, he’s activated the smear campaign, and one of the smear activists gets this written on my Wikipedia page. Then in this smear campaign, all spontaneously appearing within a period of two months in which 50 articles are written on the Web or blogs or posts, a woman I’ve never met, Carolyn Baker, never spoken to anyone on my staff—a person on my team called her to fact check and create dialogue; she hung up the phone—she writes an article and says: Gafni is not like the rest of us. He’s a sociopath. Kind of devastating. And the responses on the Internet are of course: put a bullet in his head if you meet him, because she’s created a virtual persona of a crazed sociopath which has no face-to-face relationship, has no intimacy, has no fact checking, has no basis in any kind of depth, any kind of veracity. So then the wife of the person who organized the smear campaign posts a blog, and in her blog she rails against me as being a horrific person. What are her sources? She cites my Wikipedia page that has been changed in the smear campaign to read: Gafni confesses to being involved with 14-year-old girls, number one. Two is she cites Carolyn Baker’s article in The Huffington Post saying that Gafni is a sociopath, not like the rest of us, which is basically a license to kill someone. He’s a sociopath. He’s not like the rest of us. It’s a shocking thing to say. The person doesn’t know me. The smear activist who changed my Wikipedia page has no information, is saying something completely false. 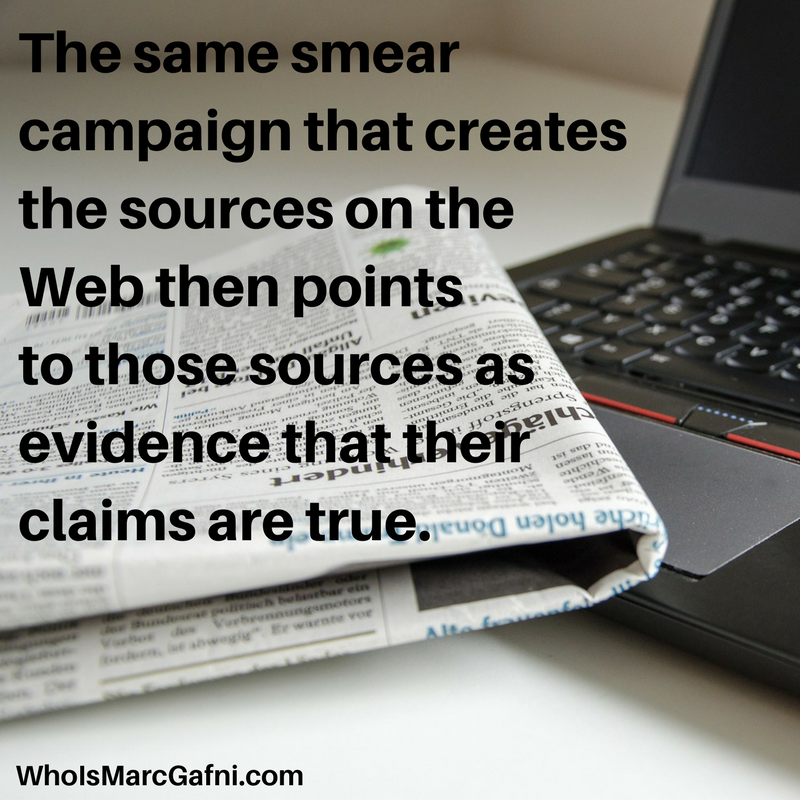 So the smear campaign creates sources on the Web, and then the same smear campaign that creates the sources on the Web then points to those sources as evidence that their claims are true. So, just follow with me one more step. So the smear campaign creates source one: a false Wikipedia posting, source two: very easy to do, a Huffington Post blog. There are thousands and thousands of blogs on The Huffington Post, so it’s easy to recruit a writer. Neither of those have checked information at all. They’ve both stated things that are categorically false. Then a third source cites the first two sources as evidence of my depravity. That’s called dog-piling sources. That’s a classical McCarthyite tactic and it’s the system called the big lie. What’s the principle of the big lie? 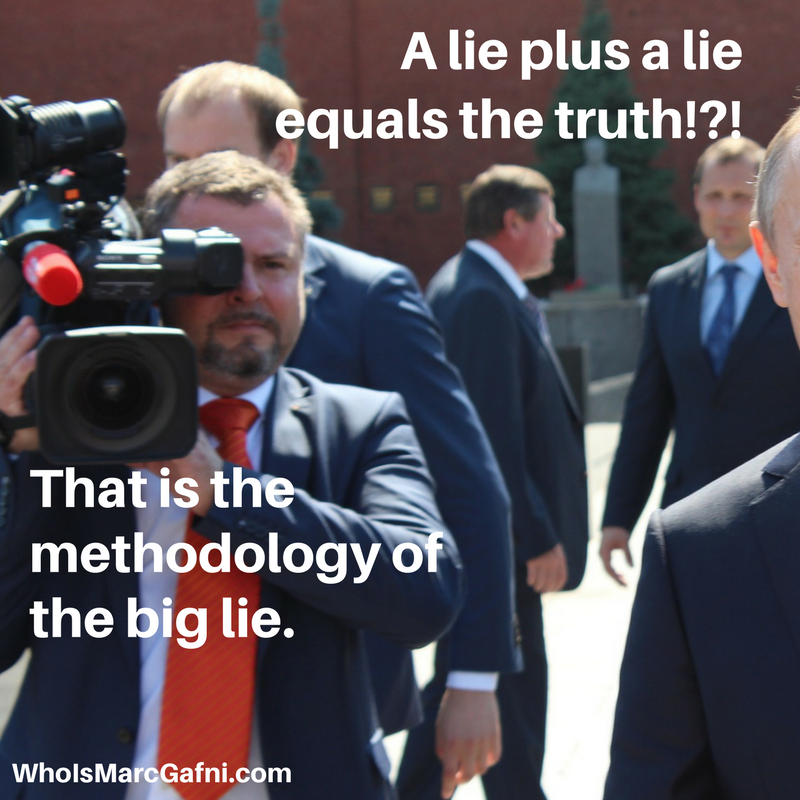 The big lie which would make any propagandist blush the way it was done in my particular case, but it can be done to any leader, to any entrepreneur, to any activist, the theory of the big lie is: a lie plus a lie equals the truth. That’s a bad equation. A lie plus a lie doesn’t equal the truth.